Travel to Toronto is becoming more and more frequent these days. Having stayed at the One King West several times and having met Executive Chef Angel Sevilla during my last stay, I planned on dining at Teller’s Bar & Lounge again this visit. I was pleasantly surprised when I learned that there was a new menu to explore! New items included the Candied Canadian Bacon Clothesline, Pizza Blanca Artisanal Pizza, Lots O’ Pepperoni Artisanal Pizza, Lamb Shank, Cauliflower and White Bean Soup. Chef is very inspired by seasonal products and is always on top of local trends – keeping his menu fresh and relevant. I was very happy to see that a couple of my favourites like the Burrata Heirloom Salad and of course my favourite cocktail, the Smoked Old Fashioned are still on the menu! I started my meal off with a Smoked Old Fashioned because – it’s always perfect. Then there was no doubt in my mind that this visit had to include the Candied Canadian Bacon Clothesline. This is a truly interactive experience! 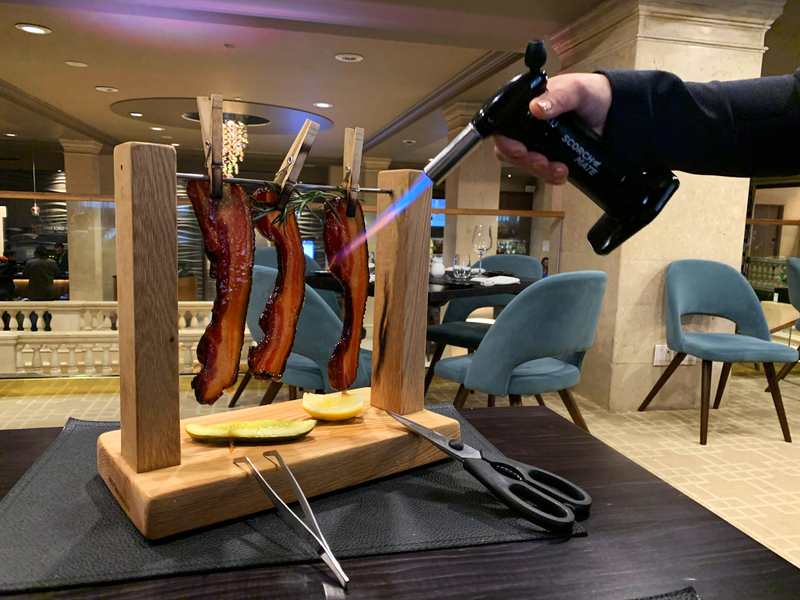 The clothesline is brought to your table and the candied bacon torched in front of your eyes – allowing you to enjoy the smell of the glaze becoming candied. I also tried the Pizza Blanca Artisanal Pizza which had a delicious mushroom sauce. So good! 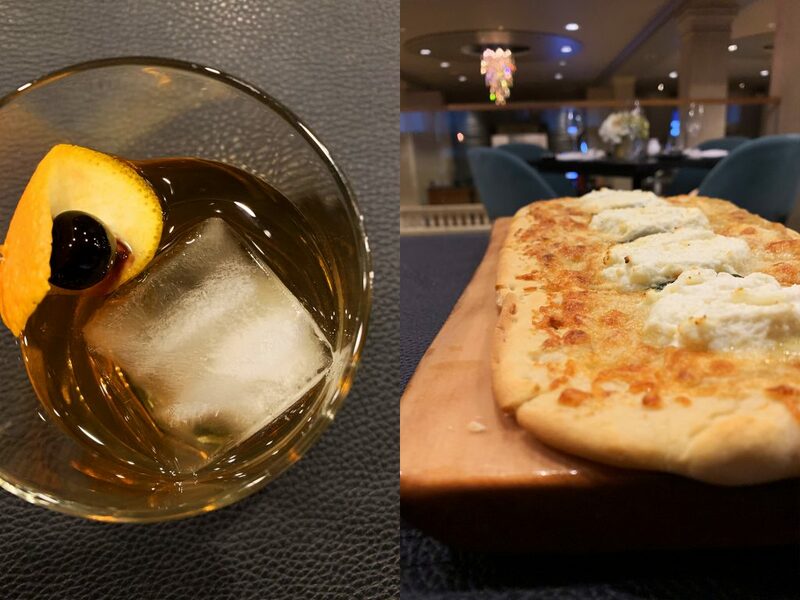 Chef Sevilla is creating a culinary destination at Teller’s Bar & Lounge and I hope you get the chance to check it out – you won’t be disappointed. But Chef didn’t stop there, he recently launched a curated Amenity Menu. There is nothing more annoying than visiting a hotel for a special occasion and wanting to enjoy something special in your room but you’re not too sure what to get. The Amenity Menu offers an array of options offered to help elevate a guest’s experience and add a special touch to ensure a memorable experience. Great for treating both yourself and someone special in their life. 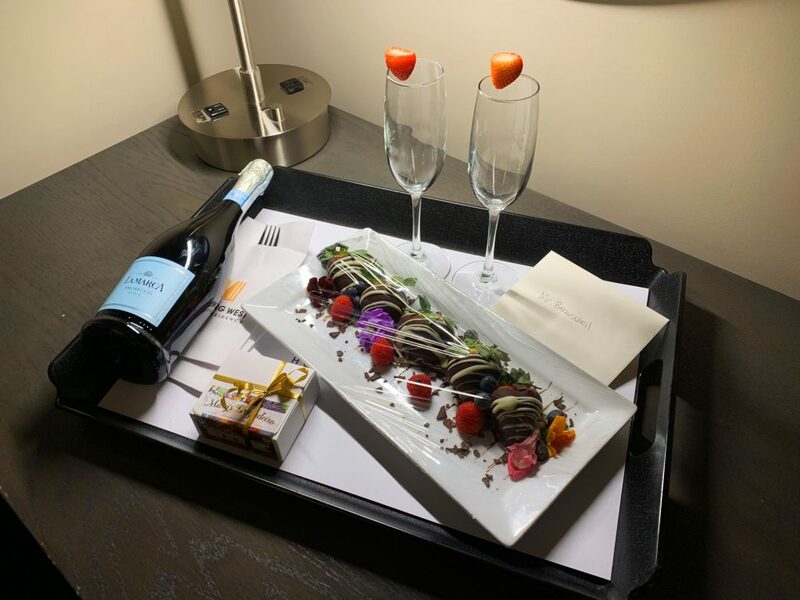 Since introducing the menu, some of the most popular options are the Mary’s Brigadeio’s (locally sourced Brazilian chocolates) and Box of Macarons – often paired with a bottle of sparkling wine for their Anniversary or Birthday Celebration Amenities. My stay was awesome as usual. I love having the luxuries of a suite in every room – making leftovers, a hot late-night snack or a hot lunch the next day. Cheers to a great stay & great food!